Have you been putting off your recommended Mercury outboard maintenance? Are you simply not sure of what to do? Maybe you are dreading dragging out the engine manual or doing your internet research? Can you even find your engine manual? For anyone who can identify with the above, this article is for you! Regular engine maintenance is essential to ensuring your engine will provide you with years of trouble-free operation. You have a choice to do it yourself or sit back and let the experts handle your maintenance. If you want the experts to help, Mercury Authorized Dealers have the expertise and training to handle all of your engine maintenance service and needs. 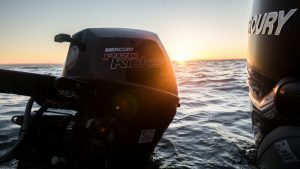 US Boatworks is a Mercury Authorized Premier Dealer with over 30 years experience in repairing and maintaining Mercury Outboard Motors in the Kansas City area. Please call to schedule your 100 and 300 hour maintenance of your Mercury Outboard. Keeping on top of the recommended procedures is a great way to keep your engine running trouble free for many years to come. For the do-it-yourselfer, timely, accurate maintenance is important. The maintenance checklist at the bottom of the page is a great summary of items to be reviewed at both 100 and 300 engine hours. The second list is a grease chart for fresh water use to insure the proper product is put into your motor. Always refer to your specific owners manual or call your authorized Mercury Motor dealer before performing these recommended services. Oils and lubricants are of course key to keeping your motor parts moving properly. Avoid being tricked into buying generic or multi-purpose oils which are inferior to genuine manufacturer oils. 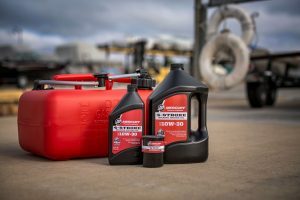 Mercury Oils and Lubricants are specifically engineered for the unique needs of marine engines and rigorously tested to meet high standards. You can get the most out of your engine while having total peace of mind that your engine is being protected when you choose oils manufactured by your engine manufacturer.